Welcoming as “better late than never” the Congress poll promise of amending the Armed Forces Special Powers Act (AFSPA), National Conference leader Omar Abdullah on Tuesday said earlier “some friends” in the grand old party had “conspired” against scrapping the controversial law when he had demanded so during his tenure as the chief minister. "I wish they would have mentioned this issue (in the manifesto) earlier when I was the Chief Minister. At that time, when I demanded AFSPA's removal, some Congress friends had conspired against it. I do not want to name them. But, I got support only from (former Union minister P) Chidambaram," he said. Puducherry chief minister V Narayanasamy expressed gratitude to Congress chief Rahul Gandhi for promising in the party's manifesto that it would procure full statehood for the Union Territory, if elected to power after the Lok Sabha polls. Addressing reporters at the party office in Puducherry, Narayanasamy said, "The specific announcement in the manifesto that the Congress would procure statehood for Puducherry now a Union Territory shows that the party and its leader have concern for the welfare of the people here." He further said, "The demand for statehood had been raised for years together as the present constitutional status of Union Territory had been standing in the way of getting sufficient grants from the Centre and most of the time the plea had fallen on deaf ears." Uttar Pradesh Chief Minister Yogi Adityanath Tuesday dismissed the Congress manifesto as a “bundle of lies” and also targeted the Opposition over its handling of national security. "It is a bundle of lies and the party has expressed its failure over 55 years in its 55-page manifesto," he said. Election Commission of India writes to secretary of Ministry of Civil Aviation and Railway Board's chairman over 'noncompliance of lawful instructions and lackadaisical approach towards enforcing the model code of conduct'. On 27 March, the poll panel had written to Ministry of Railways and Ministry of Civil Aviation, asking them why have the pictures of Narendra Modi had not been removed from rail tickets and Air India boarding passes even after Model Code of Conduct had come into effect. BJP party president Amit Shah declared at his public address in Sivaganga that the NDA alliance under the leadership of Narendra Modi will win over 30 seats in Tamil Nadu. The battle of Bengal is all set to heat up with Prime Minister Narendra Modi and Trinamool Congress president Mamata Banerjee kickstarting their campaign on Wednesday in the state that sends third largest number of Lok Sabha members to Parliament. While Modi will address a rally at Siliguri, Banerjee​ will hold her first public meeting for the general elections in the state at Dinhata, both in north Bengal. Political circles are agog that a war of words are on the cards with Mamata Banerjee deciding to hold her public rally on the same day the Prime Minister will commence his campaign in the state. 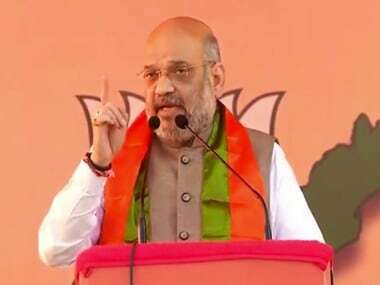 Addressing a rally in Sivaganga, BJP chief Amit Shah said, "In their manifesto, the Congress has announced that all should get bail and no one should be put behind bars. Probably, it's meant for Karti Chidambaram." According to reports, Priyanka Gandhi Vadra will accompany Congress president Rahul Gandhi to Wayanad in Kerala for filing of his nomination from the parliamentary constituency. Rahul will file his nomination from Wayanad on 4 April. Speaking at the Congress press conference, senior leader Jairam Ramesh said, "We have promised that farm loan waiver is the first step. But we want to move from karz maafi (loan waiver) to karz-mukti (loan-free)." Hitting out at Arun Jaitley over his remarks on the Congress manifesto, P Chidambaram said, "I can say that it (promises in manifesto) is unimplementable by a BJP government. Why do you think it can't be done by a future government? Congress sets ambitious goals, but these are achievable with wise and competent government. At the BJP press conference on Congress manifesto, Arun Jaitley said, "Rahul Gandhi said that we will fill 28 lakh jobs. The next sentence of Congress manifesto says 20 lakh jobs are of them are in the state government. He must at least read what he is saying." "I seem to have read the manifesto more than Congress president," he further said, taking a dig at Rahul. "What is here in these 54 pages is what we heard from the people of India. We believe this is the narrative which the people want to hear and which the people want to be addressed by the future government. We are confident that the Congress will have the capacity to implement this manifesto over the next 5 years. We think our economy will be stronger, and poverty will be considerably reduced," former finance minister P Chidambaram said at a press conference. On Congress' NYAY scheme which said that the growth in economy will help Centre fund it, Arun Jaitley said, "This is such a plan that I will buy a chicken, it will give the egg, which will create thousands of chickens, then I will become a millionaire." On Congress' promise to review AFSPA, Arun Jaitley said, “The dilution of AFPSA was opposed by Congress and now the current leadership is now advocating for it. It will empower terrorists and their supporters." Claiming that the Congress manifesto has ideas which will divide India, Arun Jaitley said, "They are moving forward on the agenda of the Nehru-Gandhi family's historic blunder on Jammu and Kashmir." He further added, "They are saying the law of sedition will be removed, the party which wants this does not have the right to get even a single vote." He also claimed that the Congress wanted to scrap sedition law in its bid to save the separatists. Union minister Arun Jaitley said, "When out of ignorance he makes unimplementable and dangerous promises, I'm sure the country will not be in a mood to oblige him for implementing the kind of promises in this manifesto. Some of the ideas are positively dangerous. Even though there was a drafting committee, It appears that some of the important points have been drafted by the Congress president's friends in the tukde tukde gang when it deals with Jammu and Kashmir." Addressing a rally in Tuticorin, BJP chief Amit Shah said, "In their recent manifesto, the Congress has proposed to tone down AFSPA in J&K. Do they want to demoralize the forces and their personnel?" 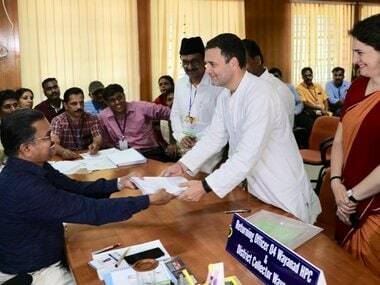 Congress president Rahul Gandhi on Tuesday claimed people in South India "feel hostility" from Prime Minister Narendra Modi and said he decided to contest from Wayanad in Kerala to send out the message that he stands with them. "There is a feeling in South India, a very strong feeling in South India, that they are not being carried (along) by the current government. South India feels hostility from Mr Narendra Modi, they feel that they are not being included in the decisions of the country," Rahul said. Ex-navy chief Admiral L Ramdas has written a letter to the Election Commission on Uttar Pradesh chief minister Yogi Adityanath referring to the Indian Army as 'Modi ki sena' during a public rally in Ghaziabad on 30 March, ANI reported. Earlier, PTI had quoted Ramdas as saying, "The armed forces do not belong to any one individual, they serve the country. Till the polls get over, the Chief Election Commissioner is the boss. I am going to approach the Election Commission in this regard." Omar Monday said his party will strive hard for restoring the autonomy of Jammu and Kashmir that could include having a separate 'Sadar-e-Riyasat' (President) and 'Wazir-e-Azam' (Prime Minister). Gambhir slammed these comments advising Omar to take a nap and some strong coffee. Omar hit back with some sage wise in turn. He asked Gambhir to stick to his area of expertise and not lecture him on matters he does not understand. In what appears to be a compromise formula, Tejashwini Ananth Kumar has been appointed the vice-president of state unit after the party denied her ticket from Late Ananth Kumar's traditional constituency Bengaluru South. Instead of Tejashwini, the BJP picked Ananth Kumar's political prodigy Tejaswi Surya, causing some heartburn to the former's supporters. In this backdrop, the new position seems to be a bid to pacify the agitated section and prevent any split in the party just before the elections. With the BJP wasting no time in latching on to Congress' promise to review AFSPA, the grand old party has found itself on the defensive moments after the release of its manifesto. Party spokesperson Randeep Singh Surjewala said that the Congress will only move forward with it after due consultation with the security forces. "The Bofors scam during the Congress regime and the Rafale scam during the BJP regime shows that both these parties do not have any interest in strengthening our security forces," Mayawati said while addressing a rally in Bhubaneswar. The Congress party promised in its manifesto to re-look at the controversial Armed Forces Special Powers Act, opening a floodgate of criticism from BJP and its supporters. The act gives security forces immunity from prosecution in war zone and gives them substantial power to conduct operations in such areas. But the announcement to review the act gave BJP the ammo against party it had been looking for. Here's what the party's I-T cell head said. Shiv Sena chief Uddhav Thackeray on Tuesday said his party and the BJP are bound by Hindutva and the two decided to enter into a pre-poll alliance after overcoming differences that soured their ties in the past. In an interview to Sena MP Sanjay Raut in party mouthpiece 'Saamana', Thackeray said he agreed to the alliance after BJP president Amit Shah came to him twice to sort out the issues. "...You ask me why did we agree to an alliance again. The whole world is a witness. BJP president Amit Shah came to me not once, but twice. And when the alliance was charted out, we put forth the problems of people. Even the chief minister was present when all this happened," Thackeray said. Sam Pitroda, Indian Overseas Congress Chief on party's election manifest said, "Don't underestimate our ability to deliver, we'll deliver. We promised we'll deliver. We've delivered in past and we'll deliver in future. Who created telecom jobs?How did we get from 2 mn telephones to 1.2 bn?" Rahul Gandhi repeated his dare to prime minister Narendra Modi for a debate on issues of national importance. "Who is he scared of, I challenge him to come and have a debate with me on any issue," Rahul said. In Congress manifesto, party president Rahul Gandhi has promised to allocate 6 percent of the GDP to to the education sector and an accessible healthcare setup. Elections more often than not become a war of words, with political leaders harping on catchy wordplay which makes their campaign narratives rememberable for the voters. This year we heard prime minister Narendra Modi latchin on to the 'chowkidar' narrative to put focus on his incorruptible image. 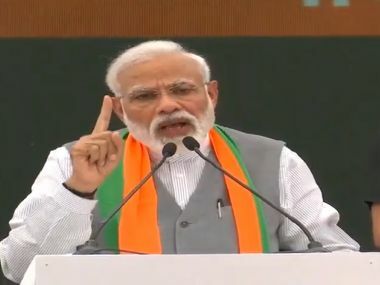 "Ek taraf mazboot chowkidar, dusri taraf daagdaro ki bharmaar," the prime minister coud be heard saying at his rallies. The Congress manifesto promised a re-look at the the Armed Forces (Special Powers) Act, 1958 in order to strike a balance between the powers of security forces and the human rights of citizens and to remove immunity for enforced disappearance, sexual violence and torture. The party also promised to repeal the sedition law stating that it has become redundant. "Will India be a free and democratic country and will the Indian people be free from fear, free to live and work and pray and eat and love and marry according to their wishes, free from poverty and free to pursue their ambitions? Or will India be governed by a pernicious ideology that will trample upon people’s rights, institutions, conventions and the healthy differences that are the essence of a multi-cultural country?" the party's manifesto stated. Speaking to reporters, Congress president Rahul Gandhi said, "You all drill me with questions but are afraid of taking on Modi ji. Why don't you ask him some questions?" "He has never ever addressed a press conference so far, why don't you ask him why is he so afraid of talking to media," Gandhi said. "PM had spoken about MGNREGA. He mocked and said it is a bogus and useless scheme. Today everyone knows how much it helped the country. So now we want to guarantee jobs for 150 days, instead of 100 days, under the scheme," Rahul Gandhi said. When asked about his decision to contest from a smaller seat Wayanad, Rahul Gandhi said that the narrative has been set and it is about the real issues like unemployment, GST and healthcare. "The prime minister is trying to hide behind hollow narratives, but he can't do that anymore." Rahul Gandhi said that he had instructed Congress manifesto committee to not put any lies in the manifesto unlike what the BJP does. "When we started the process for drafting the Congress manifesto one year ago, my first instruction to them was that don't make it behind closed doors and secondly, don't put anything that is a lie in it." "I don't want a single thing in the manifesto that is a lie because we hear the PM speak a lie every day," said Gandhi. Congress president Rahul Gandhi, Sonia Gandhi, and Manmohan Singh unveil poll document at the AICC headquarter. The theme of the document is "marrying wealth to welfare". Congress released its manifesto claiming that the theme of the election document was marrying welfare to wealth. He said that apart from wealth creation and economic boost, the manifesto will focus on three main issues: unemployment, women's security, and agrarian crisis. Chidambaram said that the manifesto will be a guiding document for governnance. 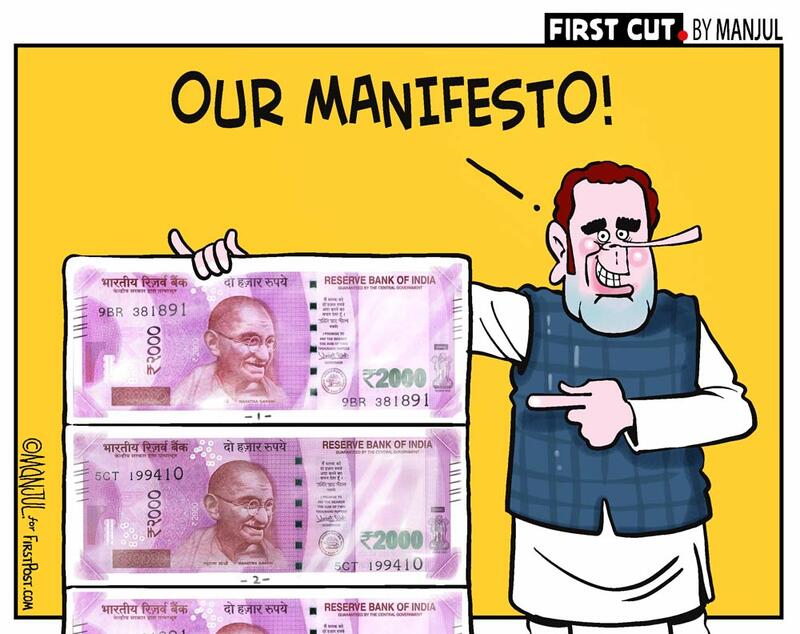 During the launch event of Congress manifesto, party spokesperson Randeep Singh Surjewala said that a promise made by the Congress was as good as an oath. The party revealed its manifesto. Congress leader Sam Pitroda was spotted at the Congress headquarters in New Delhi ahead of the party's presser announcing its manifesto. He was recently in the midst of a controversy for allegedly trivializing the Pulwama attack, and asking questions. Prime Minister Narendra Modi, who is addressing a rally in Kalahandi in Odisha, asked the crowd whether they were benefiting from the central government schemes. Modi recalled each social welfare scheme implemented under his government and asked people to tell him who made it possible. The crowds responded with the chants of 'Modi, Modi." The prime minister, however, in the end said that all this was not just because of him but because of the power in people's vote. Congress president Rahul Gandhi's tweets since 25 March could be an indication of the party's anticipated manifesto, reports speculated on Tuesday. "Congress is likely to announce 'Mega Doles' this elections season," The Economic Times reported. Even as speculation is rife about the Congress' manifesto and what it will contain for the crucial Lok Sabha election, party president Rahul Gandhi on Monday tweeted, "Real smart cities are built by good leaders. To improve quality of life in our cities we will move to directly elected Mayors with 5-year terms and elected councils. Administration will be run by multidisciplinary teams of specialists & experts accountable to the Mayor and council." Bhalchandra Mungekar, member of Congress party's manifesto committee on Tuesday said, "When we will come to power, on the first day we will initiate an inquiry into Rafale deal and we have included this in the manifesto." 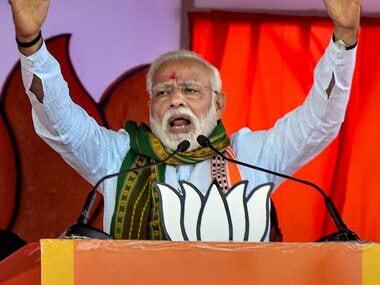 Narendra Modi says Maharashtra, Andhra Pradesh, Telangana rallies were "overwhelming"
Prime Minister Narendra Modi on Monday held election rallies in Maharashtra's Wardha, Telangana's Secunderabad, and Andhra Pradesh's Rajamundry. "My campaigns across Maharashtra, Andhra Pradesh and Telangana have been overwhelming. NDA’s solid track record and development agenda has connected with people," the prime minister tweeted. BJP national president Amit Shah will hold public meetings on Tuesday, at Thoothukudi, Sivaganga and Coimbatore in Tamil Nadu. Later in the evening, he and the BJP's Bengaluru South candidate Tejaswi Surya will hold a joint road show in Bengaluru. Uttar Pradesh chief minister Yodi Adityanath will interact with nearly 10,000 youngsters in Gorakhpur as part of the party's Yuva Sammelan. Prime Minister Narendra Modi will address an election rally at Bhawanipatna, the district headquarter of Kalahandi district in western Odisha. From there, he will travel to Ballopur village in Bihar's Jamui district for a rally and then to Gaya's Gandhi Maidan, where he and Bihar chief minister Nitish Kumar will address another rally. The Supreme Court has declined to hear newly-joined Congress leader Hardik Patel's plea seeking a stay on his conviction. Since the last date of filing nomination for the Lok Sabha election is on Thursday, the apex court's decision might mean Patel may not be able to contest the election. BJP leader says won't give Muslims tickets because they "don't believe in us"
KS Eshwarappa, a BJP leader from Karnataka, while addressing members of the Kuruba community along with other minorities in Koppal said, "Congress uses you only as a vote bank, they don't give you tickets. We won't give Muslims tickets because you don't believe in us. Believe us and we'll give you tickets and other things." Union minister Ashwini Choubey has been granted bail by a Bihar court in connection with his alleged misbehaviour towards Bihar sub-district magistrate KK Upadhyay in Buxar. The official had stopped Choubey's convoy for violating the Model Code of Conduct on 30 March. Baba Ramdev also hit out at National Conference leader Omar Abdullah over his statement that the party would seek the restoration of the terms of accession of Jammu and Kashmir, including the provision for 'Sadr-e-Riyasat' (president) and prime minister posts. Ramdev said, "Those who want a separate constitution should leave India, adding that people who want "another nation" should be labelled as "desh drohis". Congress president Rahul Gandhi is planning to chair a high-level meeting with party leaders PC Chacko and Sheila Dikshit over the possible alliance with the Aam Aadmi Party (AAP) for the Lok Sabha election in Delhi. An announcement of the final decision is likely, reports said. The party has been ambiguous over this issue over the past week, even as Arvind Kejriwal on Monday stated that Rahul had "refused" the alliance with AAP. Arvind Panagariya, former vice chairman of NITI Aayog expressed doubts about the Congress' much-debated NYAY, or minimum income support programme. Ahead of the Congress' release of its manifesto for the Lok Sabha election, Panagariya said, "If you are giving Rs 72,000 per annum to 5 crore families then there will be an expense of Rs 3.6 lakh crore — this is 13 percent of the total budget of central government. "No one has given details of scheme regarding how Rs 3.6 lakh crore will be arranged for the scheme's implementation. It's more than our defence budget. Fiscal situation is always tight, it's almost impossible to take out 13 percent of the budget. The much-debated Nyuntam Aay Yojana (NYAY) or Minimum Income Support Programme (MISP), which was announced by Congress president Rahul Gandhi in March, is expected to be the key aspect of the Congress' manifesto. "It will also serve the additional purpose of ‘remonetisation’ or ‘note wapsi’ of the Indian economy, which was badly hit by Prime Minister Narendra Modi’s destructive demonetisation," the release said. The Congress, which is likely to release its manifesto for the Lok Sabha election on Tuesday, had initiated a consultation process for the document which spanned across the country and many of its top leaders had interacted with a host of people from different sections to seek their views on their aspirations from the party, PTI reported. Congress president Rahul Gandhi has said that the manifesto will reflect the "people's voice" and not just "one man's view", while reportedly making a reference to Prime Minister Narendra Modi. The Congress document is the result of extensive nationwide consultations and it will be a very "powerful" document aimed at redressing key challenges facing the nation, Rahul said. The Congress is likely to release its manifesto for the Lok Sabha election on Tuesday. The manifesto document will be released by Congress president Rahul Gandhi and all top party leaders, including former prime minister Manmohan Singh, will be present at the party's Akbar Road headquarters. So Congress wants to amend the Armed Forces Special Powers Act. It wants to deprive them of immunity in what is literally a war zone. Congress party's manifesto website has crashed moments after its release. The party said that the issue was caused due to "heavy traffic" and the website would be back up shortly. We're experiencing heavy traffic on our Manifesto website right now - we'll be back up soon. The Congress party has promised to immediately withdraw the widely resented Citizenship Amendment Bill introduced by the BJP-led government against the wishes of the people of the North Eastern States. It also promised to ensure that no citizen of India is denied inclusion in the final National Register of Citizens. Rahul Gandhi has said that the Congress, if voted to power, will start a separate agrarian Budget. He claimed that the party will ensure that non-payment of loans by farmers is no longer deemed a criminal offense. The Congress said it drafted its manifesto only after incorporating ideas and hopes of millions of Indians. Rajeev Gowda said that the party held discussions at at least 60 locations at around 60 locations around India. He also claimed that the party reached out to around 3 lakh NRI's before drafting the manifeso. People's Republican Party leader Jayadeep Kawade made a sexist barb against Union Minister Smriti Irani, who is contesting elections from Amethi against Rahul Gandhi. Commenting on Irani's bindi Kawade has said that bigger the size a woman's bindi the more number of husbands she has had. Apart from the bizarre lack of any logical connect, Kawade's comment was also in extremely bad taste. Irani is yet to react to the issue. 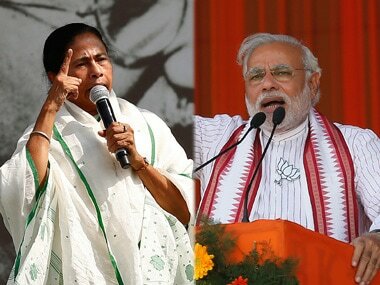 Lok Sabha Election 2019 Latest Updates: The battle of Bengal is all set to heat up with Prime Minister Narendra Modi and Trinamool Congress president Mamata Banerjee kickstarting their campaign on Wednesday in the state that sends third largest number of Lok Sabha members to Parliament. While Modi will address a rally at Siliguri, Banerjee​ will hold her first public meeting for the general elections in the state at Dinhata, both in north Bengal. AICC general-secretary Priyanka Gandhi Vadra to accompany Congress president Rahul Gandhi to Wayanad in Kerala for filing of his nomination from the parliamentary constituency. Rahul Gandhi will file his nomination from Wayanad on 4 April. Hitting out at Arun Jaitley over his remarks on the Congress manifesto, P Chidambaram said, "I can say that it (promises in manifesto) is unimplementable by a BJP government. But why do you think it can't be done by a future government? Congress sets ambitious goals, but these are achievable with wise and competent government." Addressing a press conference, Union minister Arun Jaitley lashed out at the Congress for promising to review AFSPA in its manifesto. “The dilution of AFPSA was opposed by Congress and now the current leadership is now advocating for it. It will empower terrorists and their supporters," Jaitley said. Rahul Gandhi said that the narrative has been set and it is about the real issues like unemployment, GST and healthcare. "The prime minister is trying to hide behind hollow narratives, but he can't do that anymore." Congress president Rahul Gandhi, Sonia Gandhi, Manmohan Singh unveil poll document at the AICC headquarter. P Chidambaram said that the COngress manifesto tries to encapsulate aspirations of farmers, youths, minorities, women security. Amid speculation and anticipation regarding the Congress' manifesto for the crucial Lok Sabha election, Congress president Rahul Gandhi's tweets are an indicator of content in party's manifesto, The Economic Times reported. Rahul tweets since 25 March could be an indication of the party's anticipated manifesto, reports speculated on Tuesday. "Congress is likely to announce 'Mega Doles' this elections season," the report said. The Congress on Tuesday said that the Rafale inquiry is part of the party's manifesto for the Lok Sabha election. Bhalchandra Mungekar, member of Congress party's manifesto committee on Tuesday said, "When we will come to power, on the first day we will initiate an inquiry into Rafale deal and we have included this in the manifesto." The much-debated Nyuntam Aay Yojana (NYAY) or Minimum Income Support Programme (MISP), which was announced by Congress president Rahul Gandhi in March. BJP national president Amit Shah will also hold public meetings on Tuesday, at Thoothukudi, Sivaganga and Coimbatore in Tamil Nadu. Later in the evening, he and the BJP's Bengaluru South candidate Tejaswi Surya will hold a joint road show in Bengaluru. Meanwhile, the Congress is likely to release its manifesto for the Lok Sabha polls on Tuesday. The manifesto document will be released by Congress president Rahul Gandhi and all top party leaders, including former prime minister Manmohan Singh, will be present at the party's Akbar Road headquarters. Rahul has said that the manifesto will reflect the people's voice and not just one man's view, while making a clear reference to Prime Minister Narendra Modi. He has also said the manifesto will lay major thrust on jobs creation, addressing agrarian distress and strengthening the education and health sectors besides charting a roadmap to boost economic growth. Congress had initiated a consultation process across the country and many of its top leaders had interacted with a host of people from different sections to seek their views on their aspirations from the party. The party's manifesto committee was headed by former finance minister P Chidambaram. The Congress on Monday also accused Modi of dividing the country on the basis of religion and culture and demanded his apology even as it asked the Election Commission (EC) to take "decisive action" against him for violating the law. The Opposition party also accused Modi of insulting democracy by trying to segment Indians in terms of castes and communities. Congress's chief spokesperson Randeep Surjewala charged the prime minister with indulging in "cheap politics by sowing the seeds of hatred" among people and alleged that Modi had now gone to the extent of insulting India's composite culture and the sacrifice of the people of south India during the freedom struggle. Earlier in the day, slamming the Congress over the "Hindu terror" metaphor, Modi charged the Opposition party with insulting the "peace-loving" followers of the religion by linking them to terrorism. The Hindus had woken up and the country had decided to "punish" the Congress, the prime minister said at a public rally in Maharashtra's Wardha, adding that the opposition party was scared to field its leaders from constituencies where the majority community dominated in terms of the voter-base, without naming Rahul.